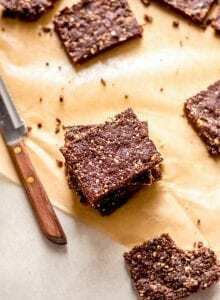 You only need 6 ingredients for these simple, raw vegan brownies. They’re healthy enough to eat anytime of day for a snack but decadent enough to enjoy as a dessert too! Add the almonds to a food processor and mix until mostly broken down. It should resemble coarse flour. Add the rest of the ingredients and mix until it forms a thick dough. The dough should come together into one big ball as it processes. If it seems too dry, add warm water 1 tbsp at a time until the dough all comes together. It should be very thick and sticky. Line a small square baking pan (mine was 7 x 7 inches) with wax paper, parchment paper or saran and then firmly press the dough into the pan. Set in the freezer for at least 30 minutes. Cut into 8 bars or 12 squares and enjoy! Leftovers can be stored in an air-tight container in the fridge for up to 2 weeks or freezer for up to 3 months. If your dates aren’t soft and moist, soak them for 10-15 minutes in warm water and drain well before using. The almond butter should be drippy, not dry otherwise they won’t hold together. To make the orange zest, simply grate the peel of an orange until you have about 1 tbsp. If you don’t like the orange, you can go ahead and leave it out.